The packages used by SWP and SW document shells have been carefully chosen to achieve certain typesetting results. However, you may decide to add a package to your document or to remove a package that you don't need. If you add packages, you may also be able to add package options and arguments for the packages you specify. On occasion, you may want to use a package that isn't part of your program installation. In that case, you must add it to the installation before you can add it to your document. Note Unless you're very familiar with LaTeX and LaTeX packages, we urge you not to remove packages specified by the document shell. From the Package Options tab, you can see the list of packages in effect and those that are available to be added to your document. 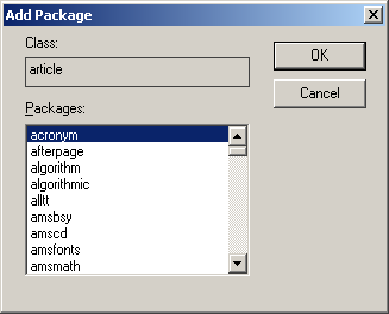 Note that the list of available packages differs for different versions of the program. Remember that the order in which you specify packages can affect LaTeX behavior. By default, the program automatically manages LaTeX packages, adding certain packages such as amsmath to most SWP and SW documents. If you have Version 5, you can manage packages yourself and prevent the program from adding packages automatically. On the Typeset toolbar, click the Options and Packages button or, from the Typeset menu, choose Options and Packages. Choose the Package Options tab. If the package you want to add isn't listed in the Packages in Use box, choose Add. In the Add Packages box, scroll the Packages list to select the package you want and then choose OK. If you need to reorder the packages in the Packages in Use list, select a package and use the Move Up or Move Down controls to place the package in the correct position. Choose OK again to return to your document. If the package you want isn't listed as available in your version of SWP or SW, you can go native to add the LaTeX commands that force the program to use the package. When you typeset your document, the program passes the typesetting information directly to LaTeX for processing. If the commands are in error, LaTeX won't be able to typeset your document or to create a DVI file. Further, incorrect syntax can damage your document beyond repair. Note Be careful to enter commands correctly. Incorrect syntax can cause LaTeX to fail and may damage your document permanently. Choose the Package Options tab and choose Go Native. In the Native LaTeX Packages dialog, enter the name of the package you want, enclosed in curly braces. Remember The program passes your entries directly to LaTeX or pdfLaTeX. Incorrect syntax will cause typesetting to fail. Choose OK twice to return to your document. You can add package options and arguments for the packages you specify. 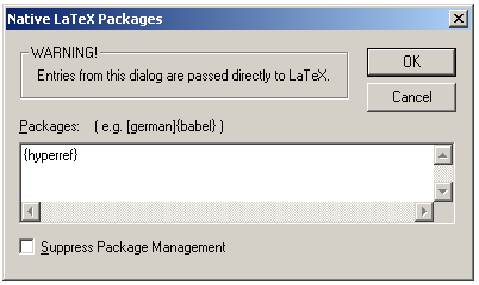 From the list of packages in the Packages in Use box, select the package you want to remove. Choose OK to close the dialog boxes and return to your document. The information in this frame was created with Scientific WorkPlace.